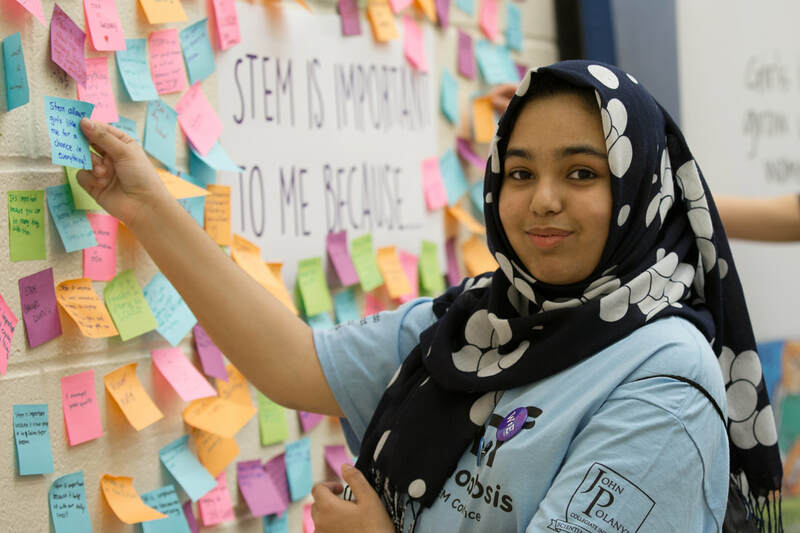 Hosted by STEM Fellowship, in partnership with John Polanyi Collegiate Institute’s Metamorphosis Girls STEM Conference, the #MySTEMStoryIs contest is a chance for girls to share their STEM stories with other girls, and the whole world. The #MySTEMStoryIs contest is a chance for you to share your STEM story! Why is STEM important to you? What is it about the science, technology, engineering and mathematics fields that inspires you? Can your STEM story inspire other girls? Please view the Scoring Guide for complete judging criteria. This contest is is open to any grade 6, 7, 8 & 9 students in Canada who identify as female. Participating contestants must be either Canadian citizens, permanent residents or foreign students living in Canada and studying in a Canadian school. Note: you do not have to attend the Metamorphosis Girls STEM Conference to participate in this contest! There are three (3) submission categories for each grade category. Videos must be shorter than three minutes. It can feature the student, or be a voice-over. Please upload your video to YouTube and submit the video link. Videos should be marked as unlisted (select this in the Privacy Settings). For instructions on how to upload videos to Youtube, please click HERE. Examples of video submissions include: drawing your STEM story, talking about what inspires you in STEM (similar to this Microsoft video: Girls Do Science), or showing what you’ve created for a science project. This can take the form of a drawing, a comic strip, a photo-series, etc. Be sure to include a short caption! Please submit your image in one of three file formats: png., tiff., or jpg. Examples of visual submissions include: taking a picture of a recent science project (e.g. knitted science ornaments), creating a comic about your STEM story/what you love most about science (e.g. The Awkward Yeti’s comics may inspire you), or creating a comic strip to share your STEM story with us. This can take the form of a one-page essay, a poem or any other written style. Please submit your entry in one of the following formats: .doc, .docx or PDF. You are limited to one page for this category. Please keep good 'netiquette' (network etiquette) in mind when you enter this contest! Remember to be mindful of your language, to not plagiarize and to respect other people’s privacy (e.g. if someone appears in your video or visual entry, be sure to ask for their permission). A general rule to practicing good netiquette is that if you wouldn’t say it or do it in-person, then you shouldn’t do so in cyberspace either. Each contestant can submit only one entry to the competition. Submissions must be received no later than Thursday February 22nd 2018 at 11:59 PM EST. A winner will be selected one winner from each submission category (video, visual, written) for each grade category, for a total of six (6) winners. Submissions will be evaluated based on the Scoring Guide. Winners will be announced at the Metamorphosis Girls STEM Conference, Thursday, March 8th 2018, and on social media platforms. All six (6) winners will be interviewed by a STEM Fellowship executive, and their STEM story will then be shared widely across social media platforms. ​Ultimately, these interviews will be published as a part of the STEM Fellowship Journal’s Perspectives & Letters section. The STEM Fellowship Journal is an open-access, PhD peer-reviewed student-run journal that publishes research primarily by high school and university students in the STEM (Science, Technology, Engineering and Mathematics) fields. Our journal is supported by Canadian Science Publishing - Canada’s largest scientific publisher.